Poczta Polska and companies from its Capital Group. The housing segment is the largest group of institutional clients. In December 2014 the Bank served 11.5 thousand clients in this group. Pocztowy Pakiet Organizacja (Organization Postal Package) and Pocztowy Pakiet Mała Organizacja (Small Organization Postal Package) - for public benefit organizations and other non-profit organizations. As for deposits, the Bank offers among others standard and individually negotiated deposits (with fixed and floating interest) with a wide range of agreement periods, Konto Oszczędnościowe Biznes (for SMEs, Housing institutions and Public Benefit Organizations) and bank accounts in foreign currencies (USD, EUR, GBP). investment loans with a thermomodernization and renovation premium offered to Housing segment institutions. sealed cash deposits (accepting sealed cash deposits from clients). Further, in 2014 the Bank continued relationships with companies offering international cash transfers. The Bank's key competitive advantage is the widest distribution network in Poland, composed of ca. 5,000 post offices and bank's sales points where customers can collect cash transfers. Since 2008 the Bank has cooperated with Money Gram Payment Systems Inc., providing agency services in cash transfers to Poland. possibility to conclude currency forward transactions under a treasury limit. In 2014 the Bank continued the works related to implementation and extension of Pocztowy24 Internet banking system with new functionalities. According to the strategy regarding institutional clients, the Bank has verified its credit policy and limited the funding of local self-government entities, Housing segment clients and SME. In 2014 the Bank limited the scope of its lending campaign addressing it only to the existing key clients holding significant deposits and using settlement services. The change in the credit policy for institutional clients will allow improving profitability of concluded credit transactions and has already translated into a reduction in credit receivables from institutional clients in 2014. Investment loans had the highest share in the institutional clients portfolio, and they accounted for 87.2% of the total credit exposure of the Bank from this group of clients at the end of 2014.
other prepaid expenses and revenue, other restricted revenue and interest and other receivables were not included. As at 31 December 2014 deposits of institutional clients amounted to PLN 1,160.7 million, i.e. by 1.1% more than at the end of 2013. In December 2014 Bank Pocztowy held a 0.7% share in the market of deposits of institutional clients and controlled 2.6% of the market of deposits made by non-profit organizations operating for the benefit of households1 (vs. 2.4% in 2013). Most institutional clients invest free cash in term deposits. At the end of December 2014 they amounted to PLN 566.9 million and increased by 9.2% compared to 2013. At the same time, their share in the structure of deposits of institutional clients increased from 45.2% at the end of 2013 to 48.9% in December 2014. 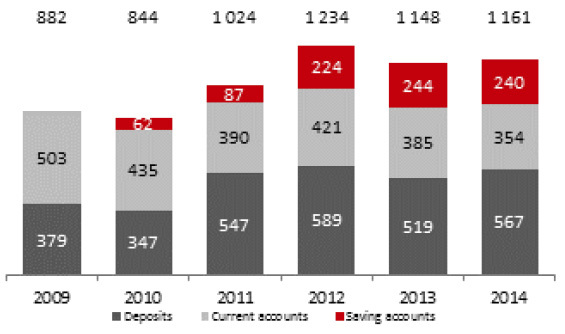 The amount of funds deposited in savings accounts of institutional clients and the balance of their current accounts slightly decreased. Source: management information of the Bank. Deposits excluding those with terms negotiated individually. Housing institutions were those to deposit the highest amount at the Bank. In December 2014 they increased in PLN 692.0 million (a 14.2% growth during the year) and constituted 54.2% of total institutional clients’ deposits. 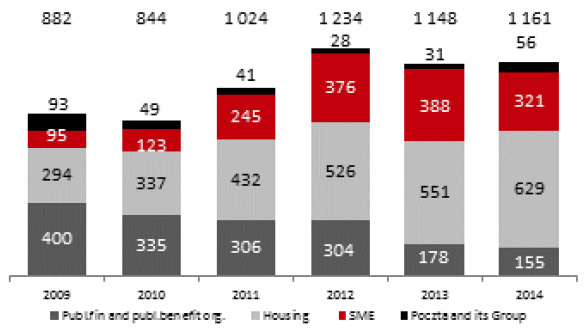 Deposits of SMEs were also considerable and amounted to PLN 320.8 million, i.e. accounted for 27.6% of the total deposits of institutional clients. In December 2014 Bank Pocztowy managed the total of 20.6 thousand of current accounts of institutional clients as compared to 20.9 thousand at the end of 2013. 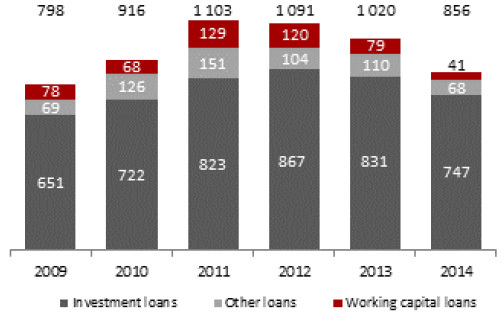 1 Source: WEBIS data for Bank Pocztowy, data of the National Bank of Poland for Monetary receivables and liabilities of financial institutions, December 2014 for the banking sector.